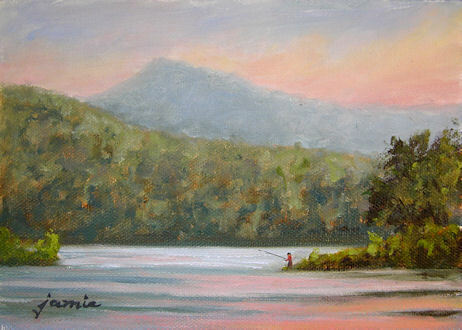 When I saw this scene, I wondered if the person who was fishing realized that he was standing right where Thomas Cole did his famous painting, Lake with Dead Trees. Whenever I’m here at North South Lake and the surrounding area, I can feel the spirit of the land that drew the Hudson River School painters to these locations. Both Cole and Cropsey painted here beside this lake, and I’m sure many others too. That’s Roundtop Mountain in the distance, although it’s often confused with nearby (and similarly-shaped) Kaaterskill High Peak. I painted this one in my little 5×7 box — perfect for “stealth painting” in all kinds of situations! This is one of my favorite places to paint. 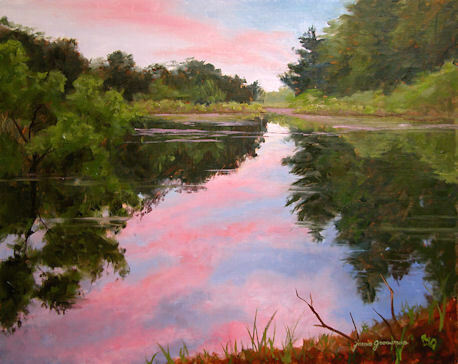 I’ve done several paintings of this beaver pond in all seasons, both from photos and on location. I never get tired of it! You can click here to see images of the painting in progress. To see the completed version of this painting, click here. 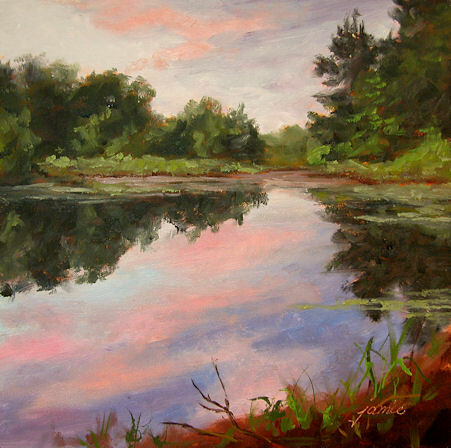 I liked the little square 6×6″ Beaver Pond Sunset so much that I did a few days ago, that I decided to do a larger, horizontal version of the painting. Above is the work in progress. 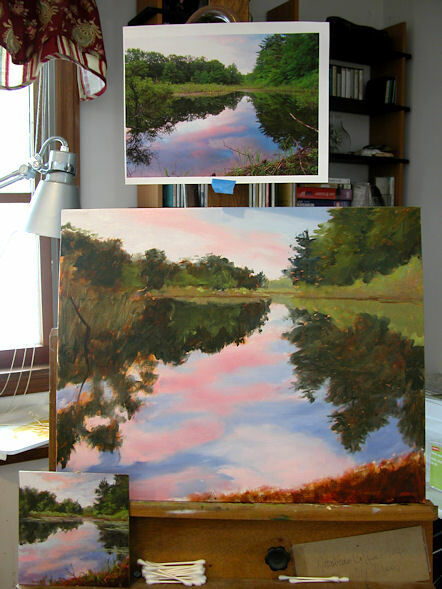 You can see my photo reference taped to the top of the easel, and the small 6×6 painting on the lower left. There’s still lots more to add and adjust, but it’s off to a good start. Below is an image showing the way I started this painting. 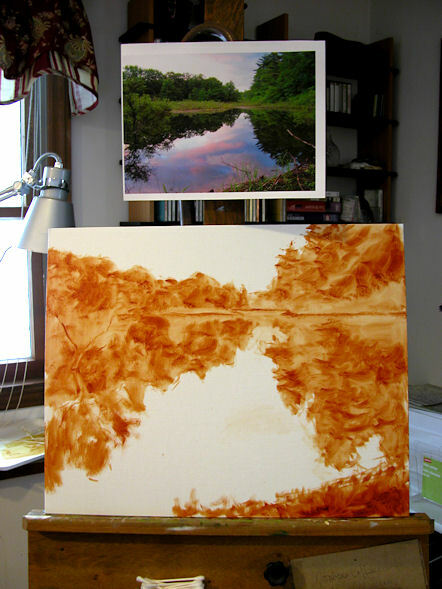 The underpainting was done just with burnt sienna, beneath where the greens would go, and following the values and brushwork that I’ll be laying over the top with different colors. 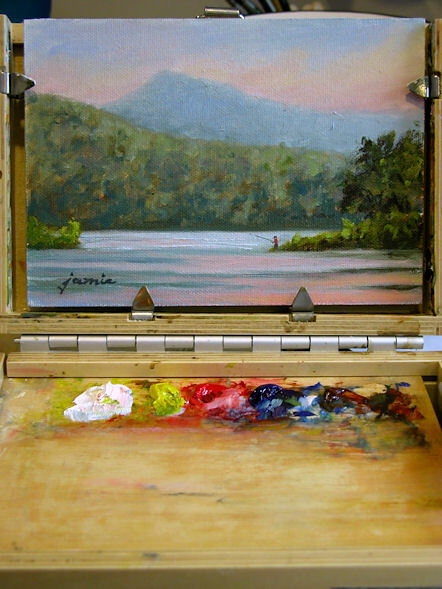 One summer evening, I was sitting in my house upstate at sunset when the most amazing color started to form in the sky. I grabbed my camera and ran out back to the beaver pond in time to catch the blues, violets and pinks reflecting in the water. I’ve been meaning to paint from that photo ever since! I opened up my little 5×7 pochade box, and nestled inside was a painting I’d totally forgotten about. 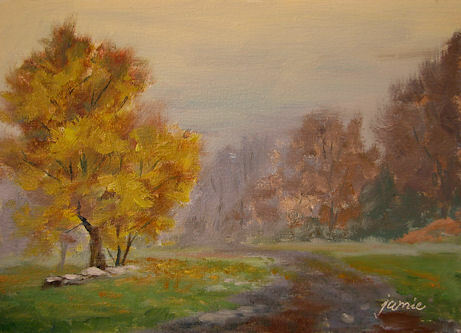 It was a painting of my driveway upstate on a foggy morning, but overall the painting was too light, and didn’t convey the heavily overcast, dull atmosphere as well as I’d like. So, I took it out and completely repainted it. Much happier with it now! This is my first painting of 2011. It felt great to get back to my brushes again after a rather extended holiday vacation! 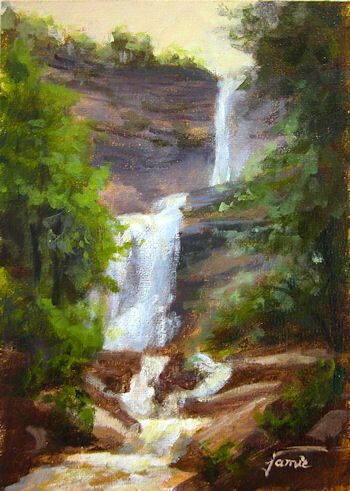 This painting of Kaaterskill Falls was done from two studies done on location plus a photo reference. I think I’ll do a 20×30″ or 24×36″ version of the scene soon. Kaaterskill Falls is the tallest waterfall in New York State, and was a favorite painting spot of the Hudson River School painters. It’s one of my favorite spots too!